Citation Information: J Clin Invest. 2007;117(3):514-521. https://doi.org/10.1172/JCI30587. Two broad hypotheses have arisen regarding the fundamental nature of the pathogenesis of inflammatory bowel diseases (IBDs, which include ulcerative colitis and Crohn disease). The first contends that primary dysregulation of the mucosal immune system leads to excessive immunologic responses to normal microflora. The second suggests that changes in the composition of gut microflora and/or deranged epithelial barrier function elicits pathologic responses from the normal mucosal immune system. Here we examine these hypotheses and conclude that IBD is indeed characterized by an abnormal mucosal immune response but that microbial factors and epithelial cell abnormalities can facilitate this response. Critical features of the mucosal immune response of normal individuals and patients with Crohn disease with defective NOD2 function. PGN derived from the walls of commensal bacteria is sensed by TLR2 on the surface of dendritic cells in the intestinal lamina propria (left inset). This leads to TLR2 ligation and the downstream activation of NF-κB, the key transcription factor necessary for the differentiation of cells producing IFN-γ and IL-17, the proinflammatory cytokines responsible for Crohn disease. PGN, however, is also broken down in endosomes and is thus a source of MDP, a substance that is sensed by and activates NOD2. Such activation initiates a mechanism of inhibition of PGN-mediated NF-κB activation and thus causes downmodulation of TLR-induced cytokine production. 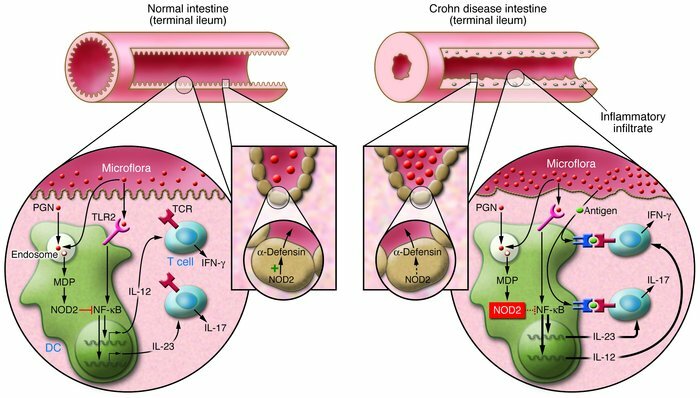 In patients with Crohn disease bearing NOD2 mutations (right inset), the NOD2 modulation is impaired, and hence the innate immune “thermostat” of the intestine is set at a higher level of proinflammatory cytokine production. This, together with a tendency of T cells to react to mucosal antigens, leads to inflammation and disease. An additional factor relates to the function of α-defensins, antibacterial peptides produced by Paneth cells at the base of crypts in the terminal ileum (middle inset). Crohn disease patients with impaired NOD2 function manifest reduced α-defensin production in part because NOD2 in Paneth cells is an inducer of α-defensin production. Thus, it is possible that impaired NOD2 function also leads to increased bacterial density in the crypts of the terminal ileum and thus greater stimulation of a mucosal immune system already set at a higher level of function.